How to use Promoted PINs to bring large number of visitors to your blog. Pinterest, the not so popular avenue to promote blogs and products among majority of the bloggers and online entrepreneurs, is my favorite browsing site. I spend considerable time in Pinterest, picking up useful info on myriad subjects. A few minutes ago, I stumbled on to post in Pinterest titled, "How $3 brought 50,000 new visitors to my blog in 3 days". As a blogger, I was impressed and instantly opened the link to the blog post. It said about how to use 'promoted pins" to market your product online. The name of author of the blog is Nadine. 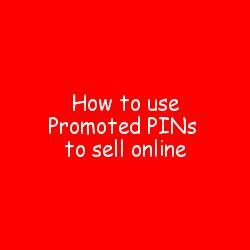 Promoted PIns work like any contextual advertising like Google AdSense or Facebook Ads. In Pinterest, instead of raw textual content, you promote your physical or digital information product using eye catching images. How to use promoted pins. 1. Change your personal account into business account in Pinterest. It is free dear. 2. Decide on which blog post to promote that contains attractive and clear images. 3. Decide on your daily budget for each click on your PIN and go through all the necessary filters you need to apply. That's it. Wait for a few days and check your Google analytics and AdSense too. You will be surprised to see the sudden spurt in the number of visitors and AdSense earnings. This is just a brief about using Promoted PINs to market your brand in the Internet with very low budget. You must do your research further to enhance your knowledge before spending money on advertising through Pinterest.